Give Fat the Cold Shoulder! This page goes into some hard-core science, with references. See our home page for a less technical explanation. “In cold-acclimated rats the scope for activity was greatly extended by the acquisition of nonshivering thermogenesis. The peak rate in resting rats was increased to 420 Cal/body weight, which is nearly double the maximal level for warm-acclimated rats…” Hart & Jansky, “Thermogenesis due to exercise and cold in warm- and cold-acclimated rats”. Canadian Journal of Biochemistry and Physiology, Volume 41 (1963). cold-induced thermogenic response protects the animal by contributing heat to the vital organs.” – Robert Smith, “Thermoregulatory and Adaptive Behavior of Brown Adipose Tissue”, Science, vol 146 no 3652, pp. 1686-1689 (1964). “One week of 2.5 hours/day of mild exercise with cold exposure led to a loss of body fat of between 0.8 and 2.3 kg. No significant changes in body composition occurred with comparable exercise under temperate conditions.” – W. J. O’hara, C. Allen, R. J. Shephard, and G. Allen. “Fat loss in the cold — a controlled study.” Journal of Applied Physiology: Respiratory, Environmental, and Exercise Physiology 45(5): 872-877 (1979). “Adult humans possess active brown adipose tissue that has the potential to combat obesity. Pharmaceutical agents intended to combat obesity by stimulating brown adipose tissue have now generally been discarded as candidates for human therapy.” – Jan Nedergaard et al., “Unexpected evidence for active brown adipose tissue in adult humans”, American Journal of Physiology and Endocrinology Metabolism vol 293 (2007). “According to the adipostat hypothesis for body-weight control, alterations in body weight should always be compensated by adequate alterations in food intake. Thus, increased thermogenesis should not be able to counteract obesity because food intake would be increased. Evidence is presented here that [this is not the case]: thermogenesis may counteract obesity, and is not always fully compensated by increased food intake.” – Cannon & Nedergaard, “Thermogenesis challenges the adipostat hypothesis for body-weight control”, Proceedings of the Nutritional Society, vol 268 (2009). “At doses leading to broad activation of the sympathetic nervous system, ephedrine does not stimulate BAT in humans. In contrast, mild cold exposure stimulates BAT energy expenditure with fewer systemic effects.” – Aaron Cypess et al., “Cold but not sympathomimetics activates human brown adipose tissue in vivo”, Proceedings of the National Academy of Sciences vol 109 no 25 (2012). “In recent years, it has been shown that humans have active brown adipose tissue (BAT) depots, raising the question of whether activation and recruitment of BAT can be a target to counterbalance the current obesity pandemic. Here, we show that a 10-day cold acclimation protocol in humans increases BAT activity in parallel with an increase in nonshivering thermogenesis (NST). No gender differences in BAT presence and activity were found either before or after cold acclimation. The observed physiological acclimation is in line with the subjective changes in temperature sensation; upon cold acclimation, the subjects judged the environment warmer, felt more comfortable in the cold, and reported less shivering. The combined results suggest that a variable indoor environment with frequent cold exposures might be an acceptable and economic manner to increase energy expenditure and may contribute to counteracting the current obesity epidemic.” — Anouk van der Lans et al., “Cold acclimation recruits human brown fat and increases nonshivering thermogenesis”, Journal of Clinical Investigation vol 123 no 8 (2013). “Brown adipose tissue (BAT) burns fat to produce heat when the body is exposed to cold and plays a role in energy metabolism. Thus, the recruitment of BAT may be effective for body fat reduction. Acute cold exposure at 19°C for 2 hours increased energy expenditure (EE) and cold-induced thermogenesis (CIT). Cold-induced increments of EE (CIT) strongly correlated with BAT activity independently of age and fat-free mass. Daily 2-hour cold exposure at 17°C for 6 weeks resulted in a parallel increase in BAT activity and CIT and a concomitant decrease in body fat mass. Changes in BAT activity and body fat mass were negatively correlated. These results demonstrate that human BAT can be recruited even in individuals with decreased BAT activity, thereby contributing to body fat reduction.” — Takeshi Yoneshiro et al., “Recruited brown adipose tissue as an antiobesity agent in humans”, Journal of Clinical Investigation vol 123 no 8 (2013). “Obesity is a consequence of positive energy balance, which can be counterbalanced by eating less, increasing physical activity, or pharmacological approaches. However, weight maintenance is generally disappointing, and long-term use of pharmaceuticals has been limited because of lack of efficacy, poor long-term adherence rates, and serious adverse effects. These limitations indicate that, given our current knowledge and available technologies, insights from other fields of research will be necessary to permit exploration of new ideas and develop effective applications. We suggest that regular exposure to mild cold may provide a healthy and sustainable alternative strategy for increasing energy expenditure.” — Lichtenbelt et al., “Cold exposure – an approach to increasing energy expenditure in humans”, Cell Press: Trends in Endocrinology and Metabolism, Vol 25 no 4 (April 2014). My own clinical trials of The Cold Shoulder suggest that when used twice a day taken directly from the freezer and worn until the ice melts, results in accelerated fat loss at the rate of about one pound a week, corresponding to about 500 calories burned per day. The Cold Shoulder is also undergoing patent examination, under non-provisional utility patent # 14/281,666.. Here is a non-exaustive list of academic articles on BAT, cold exposure, weight loss, obesity, diebetes, etc. Most of these articles are rather technical in nature; proceed at your own risk. Furthermore, although the abstracts should all be readable, in some cases the full article may require a paid subscription (or one-time payment) to read. Articles are listed in no particular order. 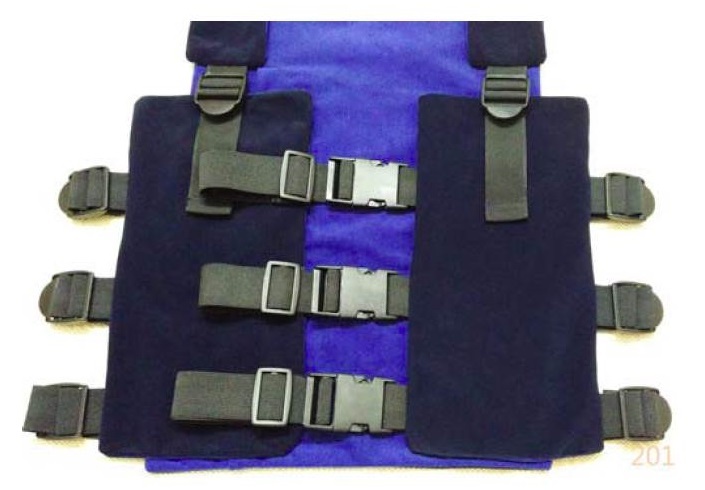 CLICK HERE to add a instant delivery PRO vest ($149) to your order! CLICK HERE to add another instant delivery Classic 2.0 ($179) vest to your order! These statements have not been evaluated by the Food and Drug Administration. This product is not intended to diagnose, treat, cure, or prevent any disease. Not all "before and after" photos are of users.